Gionee has focused its resources and energy in R&D of mobile phones and communication technologies. This is the fire that drives the innovative releases that Gionee comes up with. The Gionee S6s is one of the latest smartphones released by them. The Gionee S6s features a Mediatek MT6753 chipset, a Octa-core 1.3 GHz Cortex-A53 processor and it runs on an Android Marshmallow operating system. The Graphics on this large screen phone are powered by a Mali-T720MP3 GPU. The phone comes with standard 3GB RAM for fast computing speed for countless games and applications. The secondary camera on this is a 8MP unit which comes with a front facing LED flash. This ensures that you don’t miss out on clicking the best of selfies in the darkness of the night. The Gionee S6s features a 5.5 inch IPS LCD capacitive touchscreen with a screen to body ratio of 71.4%. The screen produces a display output of 1080x1920 pixels with a pixel density of 401 ppi. This screen resolution is more than the iPhone 7 and in par with the OnePlus 3. The screen is protected by a corning Gorilla Glass 3. The Gionee S6s comes with an internal storage capacity of 32GB and can be expanded up to 526 GB using an external memory card. The only flipside to this is that, it doesn’t come with a dedicated slot for external memory. Hence, the user wouldn’t be able to use the Dual SIM feature to the maximum. The Gionee S6s comes with a non-removable 3150 mAh Lithium ion battery that provides standby for 400 hours on 2G connectivity and 394 hours on 3G connectivity. It provides 23 hours of talktime on 2G and 11 hours on 3G. 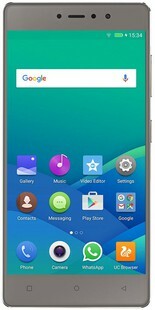 The Gionee S6s price in India is definitely in the competitive price of smartphones under 20,000 rupees. The front facing camera along with the RAM, storage space and more make the phone a perfect buying option for the selfie addicts and gamers. Gionee S6s full specs and reviews as of Apr 2019. Buy it here!